Getty Images/Kevork Djansezian; Twitter/Jana KramerJana Kramer and the note she wrote to social media shamers. 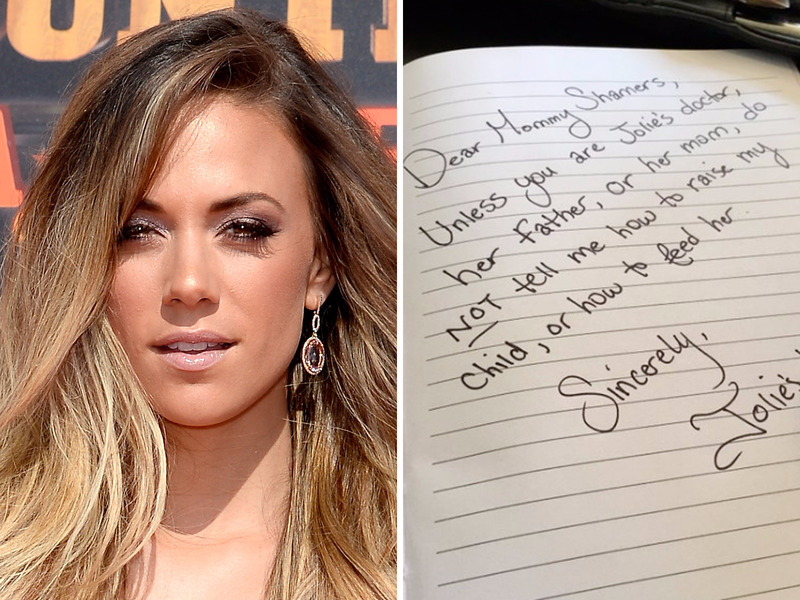 Country singer Jana Kramer is firing back at critical mums on social media, the Daily Mail reports. The debacle began two weeks ago, when Kramer posted an ordinary photo on Instagram. It showed a grocery store conveyor belt littered with jars of baby food because Kramer’s infant daughter, Jolie, was about to transition away from a formula-only diet. Soon, fellow mothers commented on the photo, chastising Kramer for buying store-made food instead of making her own. “Make your own. It’s cheaper and way healthier ;),” one commenter wrote. “So easy to make your own! Great way to avoid pesky preservatives!” said another. Kramer later penned an op-ed for TIME’s Motto blog defending her decision and urging mums to support one another.